Originally implemented in 2006 and extended in 2015, the federal solar tax credit, officially known as the Investment Tax Credit (ITC), provides a credit on federal taxes for all newly installed residential and commercial solar systems. Both homeowners and businesses that install solar can claim this dollar-for-dollar credit currently worth 30% of total installation costs. But time is running out! The full 30% credit ends after 2019! The credit will reduce to 26% in 2020 and 22% in 2021. 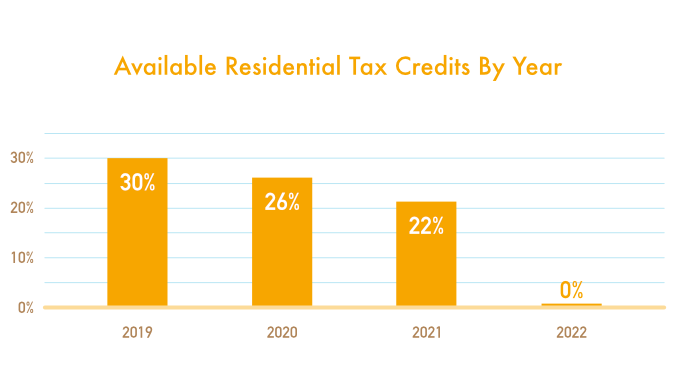 In 2022, the tax credit will be eliminated for residential systems and will remain at 10% for commercial systems. 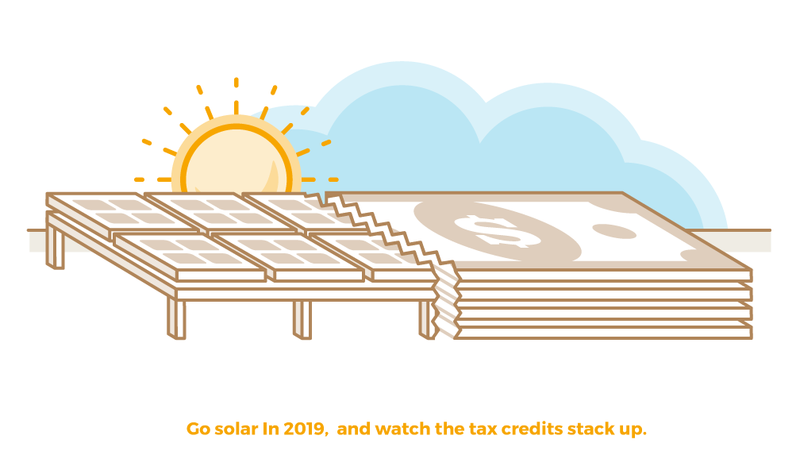 Going solar in 2019 will significantly reduce installation costs by taking advantage of the full tax credit. Contact Evoke Solar today to start planning your 2019 solar installation! How does the solar tax credit work? The solar tax credit can be claimed for the tax year in which the new system is installed and put into operation. Thirty percent of the full solar installation costs are given back to the homeowner through this credit on federal income taxes. The money that is typically given to the government stays in your pocket! There is no limit, cap, or maximum amount on the dollar value of this credit. Thirty percent of the full system installation cost is issued as a credit, and there is no limit to the dollar amount. This cost includes all material and labor associated with the installation, which means 30% of the full amount billed by Evoke Solar can count toward the tax credit. 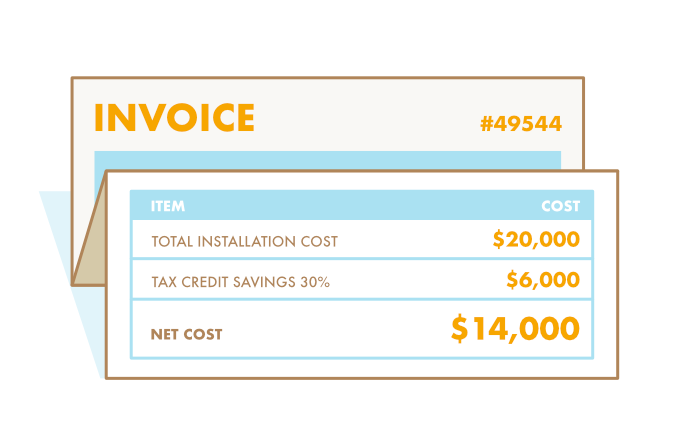 As a simple example, if a system costs $20,000 to install, the homeowner or business can expect a 30% credit in the amount of $6,000, reducing the system net cost to $14,000. The person or business paying for the system qualifies for the federal solar tax credit. The ITC is not a refund or rebate but a credit, which means it can only be claimed on taxes you owe. You therefore must have enough tax liability to receive the full amount of the credit. In some cases, when not enough money is owed in taxes to receive the full amount, the remaining credit amount can “roll-over” to the following tax year. Another way of saying it is that the tax credit reduces your tax liability. For example, if you owe $10,000 in taxes at the end of the year, and you receive $6,000 in the form of the solar tax credit, then your tax liability will only be $4,000. But if you receive that $6,000 credit and only actually owe $5,000 in taxes, you can receive that $5,000 amount, eliminating your tax liability that year, and waiting an additional year to claim the rest. If you’ve had money withheld by your employer for taxes throughout the year, the credit still applies and in this case you would receive the refund for the appropriate credit amount when you file your taxes, according to the tax amount you owed and already paid through withholding. If you sign up to lease a solar system, you are no longer eligible for the tax credit because you do not own the system. We are solar experts, but not tax experts. Talk to a tax professional about your specific qualification for the solar tax credit. If applicable, they will also help you decide how to adjust your employer withholding for the maximum benefit. For residential systems, when filing your taxes, complete Form 5695, “Residential Energy Credits” and follow all associated instructions. Contact a tax professional with filing questions and appropriate strategies for withholding adjustments. Evoke Solar designs and installs solar energy systems for homeowners and businesses in Eastern Pennsylvania and the entire state of New Jersey. With 15 years of experience, we have helped hundreds of people eliminate their own utility costs by using clean, renewable energy and claim the 30% federal solar tax credit. Get in touch with us now to start planning your 2019 install.